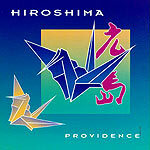 At one time, Hiroshima lent legitimacy to the "smooth jazz" movement. While David Sanborn and Kenny G were putting out glorified Muzak, Hiroshima's brand of jazz-influenced pop had an edge to it, a sense of experimentation and risk-taking. To judge by the band's new album, "Providence," those days are gone. The Japanese instrumentation remains, but the synthesis of Japanese and Western melodic structures  which made Hiroshima's music so interesting  is missing. Hiroshima has fallen back into the pack, just another faceless band putting out safe, timid music. To be sure, the sweeping melodies, rich instrumentation and multi-layered harmonies are there, laid down over a funky backbeat. It all sounds nice; it's just that it also all sounds the same.